“He said you were the thirstiest young woman he’d ever met.” So goes the one and only functional joke in the latest installment of the DC cinematic universe, Justice League. Clark Kent’s mom (Diane Lane) directs this comment to Lois Lane (Amy Adams), then quickly corrects herself to make it clear what Superman really said was that Lois was the hungriest woman he’d ever met (as in ambitious). The crazy thing is that it’s unclear whether this is even supposed to be a joke—Adams plays the scene so awkwardly. Alas, “Darkness, the truest darkness, is not the absence of light…” No, Wonder Woman, the truest darkness is the absence of humor. Darkness has its place; there’s no arguing that. Christopher Nolan put on a clinic in what darkness can do for film—at least when you throw in the right amount of sophistication—in his Batman trilogy. Skillful deployment of darkness in a superhero movie can turn what would otherwise be an exercise in frivolity into a transcendent meditation on the human condition. But darkness is powerful stuff, and when wielded in the hands of a less-than-expert director, it will overwhelm a movie and dominate all other elements. Director Zack Snyder fails to either illuminate or leaven the darkness in Justice League, and that makes it hard to enjoy the film or feel gratified by it. It’s a superhero movie, so you know the plot: There’s an otherworldly manifestation of evil bent on destroying humanity, so the protagonists must marshal their forces and prepare to sacrifice everything in the name of survival. 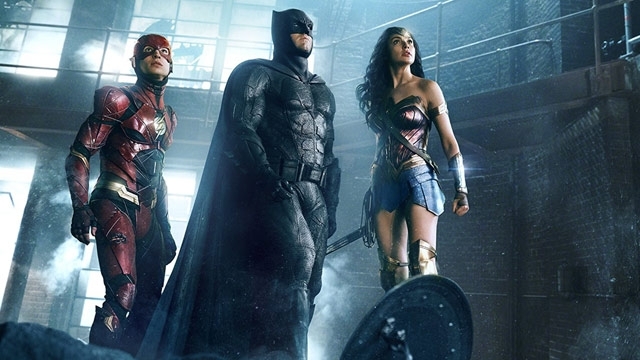 The forces marshalled in Justice League include Batman (Ben Affleck), the Flash (Ezra Miller), Wonder Woman (Gal Gadot), Cyborg (Ray Fisher), and Aquaman (Jason Momoa). The Flash enjoys an endearing dynamic with a certain other character (avoiding spoilers here), and the scenes they share are some of the film’s best. Ray Fisher’s work as Cyborg is also fantastic; he presents a contemplative, eloquent character even as he retreats into self-loathing and anxious terror when facing the evolution of his cyber self. There’s nothing inherently wrong with assembling this team of warriors, but it slows the film down quite a bit that we have to learn the backstory for so many new faces. The first 45 minutes or so of Justice League feel a bit like a montage of the first several minutes of five different movies. It’s a distinctly disjointed narrative. There are some gripping moments in the film, though, and perhaps the most compelling of them comes during the climactic battle, when the good guys get an unexpected boost from out of nowhere. This last-minute saving of the day hits hard and contributes to a satisfying collision of superpowered beings. There are a few instances of the CGI veering into cartoonish territory, but overall, the effects are excellent. Particularly impressive is the space-time warp the film snaps into whenever the Flash hits top speed. The larger problem with Justice League is that we’re deluged with these kinds of movies today. As an exercise in sheer entertainment value, Justice League succeeds admirably; it’s tempting to give the film a pass and just say, “well, as comic-book flicks go…“ But there are some pretty good comic-book movies out there these days, and we’ve come to expect more from them than just “entertainment.” And with Justice League, it seems like that’s asking too much.